In 2008, Jaeger-LeCoultre celebrated the 80th anniversary of their famous Atmos clock. As you might know already, Atmos clocks keep ticking because of temperature changes in the environment. I did a write-up in its 80th anniversary year where you can read more about the Atmos’s background and workings (click here to read it). Now, in 2011, Jaeger-LeCoultre did not only steal the show (SIHH2011) with regards to wrist watches, they also introduced a new Atmos clock. The Atmos Marqueterie Paille. Restricted to 28 pieces only, the Atmos Margueterie Paille (or straw marquetry) is celebrating an ancient decorative technique that was revived by interior designers during the 1930s. The transparent cabinet of the Atmos Marqueterie Paille appears as if by enchantment upon opening an outer cabinet delicately inlaid with wisps of straw. I have a lot of love for Atmos clocks, especially the rhodium plated steel models. This Marqueterie Paille version really blows me away, the outer cabinet is just amazing. I am afraid I have to give in at one point, but this amazing version will be gone by then. 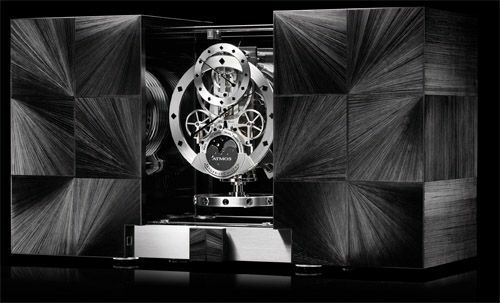 Besides the wonderful exterior, the Atmos clock is a mechanical miracle as well. The perpetual moon-phase indication has only one-day discrepancy every 3821(!) years. 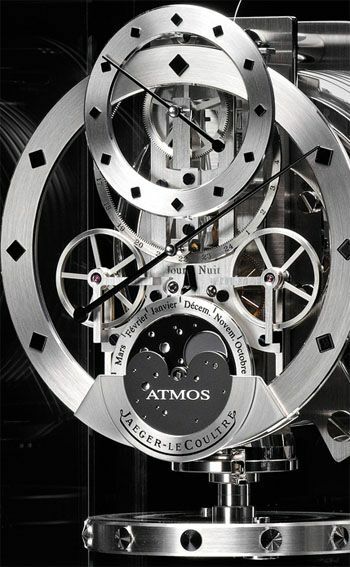 Besides a moon-phase, the Atmos can display hours, minutes and has a 24-hour indicator. The Jaeger-LeCoultre caliber 582 movement alone consist of 386 parts, and should be considered ‘almost perpetual’. Dimensions of this Atmos clock are: 321 mm x 171 mm x 257 mm.